From LeBron James' arrival in Los Angeles to Jimmy Butler's desire to leave Minnesota, it's been an eventful NBA preseason. It was a rocky one for the Timberwolves, who spent most of it dealing with the Butler drama and finished it dealing with Giannis Antetokounmpo, who had 32 points, 12 rebounds and 10 assists in just 25 minutes of Milwaukee's 143-121 romp. And it was a rough one for the Spurs, who lost three guards to injuries, including starting point guard Dejounte Murray for the season with a torn ACL. Russell Westbrook (right knee) and Dirk Nowitzki (left ankle) couldn't even get on the floor, still recovering from surgeries. Nowitzki has already been ruled out by Dallas coach Rick Carlisle for the regular-season opener next week. It's still unknown if Butler will be playing then — or for what team. He didn't travel with the Timberwolves on Friday to Milwaukee, with coach Tom Thibodeau saying he remained behind to work on his conditioning. The preseason schedule wrapped up with 11 games, with the Lakers facing Golden State in San Jose, California in the last one. James sat out, as did Kevin Durant for the Warriors. The regular season begins Tuesday with Boston hosting Philadelphia, followed by Oklahoma City visiting defending champion Golden State. Spencer Dinwiddie scored 19 points, D'Angelo Russell had 18 points and eight assists, and the Nets held on for a split of the preseason series with the Knicks. Tim Hardaway Jr. scored 18 points for the Knicks but departed with a sprained left wrist. The Knicks said X-rays were negative. The teams meet again on Oct. 19 in the Nets' home opener. NETS: Joe Harris scored 16 points and Caris LeVert had 14. ... The Nets were without starters Rondae Hollis-Jefferson (left groin strain), DeMarre Carroll (ankle) and Allen Crabbe (left ankle sprain). Coach Kenny Atkinson said Hollis-Jefferson, who didn't play in the preseason, played 5-on-5 earlier Friday and hoped the forward would be ready for opening night. Crabbe was hurt during the preseason, with Atkinson saying his injury was mild. ... G Shabazz Napier (right hamstring strain) has missed the entire preseason and Atkinson said there was no update on his condition. KNICKS: Mario Hezonja scored 14 points and Noah Vonleh finished with 13. ... Luke Kornet made three 3-pointers in the fourth quarter as the Knicks cut a 21-point deficit down to four in the closing minutes. ... Ron Baker started at point guard, with coach David Fizdale saying he is still undecided who his starter on opening night would be at that position. ... Second-round pick Mitchell Robinson started at centre after missing the last two games with a sprained right ankle. ... Trey Burke hit from about midcourt at the buzzer to end the first quarter. UP NEXT: Brooklyn (2-2) visits Detroit on Wednesday in its season opener. New York (3-2) hosts Atlanta the same night. DeMar DeRozan scored 20 points, nine coming from the line, LaMarcus Aldridge had 13 points and 15 rebound and the injury-riddled Spurs reached the century mark for the fourth time this preseason. Evan Fournier led the Magic with 23 points. SPURS: The injuries are adding up for the Spurs as Rudy Gay (heel) and Derrick White missed the game. White underwent an MRI examination Thursday that revealed a left plantar fascia tear. ... San Antonio held Orlando to 10 first-quarter points, and the Spurs led 40-30 at halftime as both teams shot less than 31 per cent. MAGIC: Orlando's first-round picks from the past two drafts played together for the first time as second-year forward Jonathan Isaac scored five points in 20 minutes and rookie centre Mohamed Bamba added 15 points in 23 minutes. UP NEXT: San Antonio (3-2) hosts Minnesota on Wednesday. Orlando (2-3) hosts Miami on Wednesday. Rookie Devin Robinson scored 23 points, 15th overall pick Troy Brown Jr. added 21 and the Wizards spoiled Marreese Speights' 41-point outburst. Speights was 13-of-27 shooting, with seven 3-pointers, for Chinese Basketball Association's Guangzhou Long-Lions. He also grabbed eight rebounds in 40 minutes. LONG-LIONS: Speights, who won a championship with the Golden State Warriors in 2015, scored 16 of his teams' 37 first-quarter points. He was 6 of 8 from the field to help the Long-Lions stay close at 38-37. He finished the half 7 of 10 for 20 points and he had 34 points at the end of the third quarter. ... The Long-Lions were 19 of 41 from 3-point range. WIZARDS: Otto Porter Jr. and Ian Mahinmi each scored 11 points in the first quarter, and Washington took control in the second quarter — outscoring the Long-Lions 34-17. The Wizards shot 61 per cent in the half, and broke the century mark in the third quarter, leading 107-85. ... Washington star guards John Wall and Bradley Beal did not play. UP NEXT: Washington (4-1) hosts Miami on Thursday. Kemba Walker and Jeremy Lamb each made three of Charlotte's 19 3-pointers. Walker scored 13 points in 17 minutes, Lamb added 11 points and rookie Miles Bridges had 13 points and seven rebounds. DeAndre Jordan had 18 points and 12 rebounds, and Luka Doncic also scored 18 for Dallas, which recently returned from two games in China. HORNETS: Malik Monk banked in a 3-pointer from beyond midcourt just before the first-quarter buzzer to pull Charlotte within 35-29. The teams, who entered averaging 30-plus 3-point attempts, combined to make 11 3-pointers in the first quarter. The Hornets led 58-53 at halftime behind Walker's 13 points. MAVERICKS: Jordan had 11 points and nine rebounds in 18 first-half minutes. Doncic made three 3-pointers in the half and scored 11 points. UP NEXT: Charlotte (4-1) hosts Milwaukee on Wednesday. Dallas (2-2) plays at Phoenix on Wednesday. Detroit's big men dominated in East Lansing. Blake Griffin scored 29 points, Andre Drummond added 21 and the Pistons made 21 3-pointers at Michigan State's Jack Breslin Student Events Center. Rodney Hood led Cleveland with 21 points, 11 coming from the free-throw line. PISTONS: Griffin and Reggie Jackson had eight points apiece in the first quarter as Detroit led 35-30. The Pistons extended it to 69-60 by halftime. Griffin had 19 points and five assists in 16 first-half minutes and Drummond added 16 points with six rebounds in 19 minutes. ... Ish Smith beat the third-quarter buzzer with a 3-ponter from the wing to extend Detroit's lead to 99-91. CAVALIERS: George Hill added 14 points and Tristan Thompson had 13 points and nine rebounds. UP NEXT: Detroit (2-3) host Brooklyn on Wednesday. Cleveland (2-2) plays at Toronto on Wednesday. Josh Richardson scored 24 points and the Heat rallied from a 13-point halftime deficit with a 66-point second half against visiting Atlanta. Miami won despite going 7 of 31 from 3-point range and committing 23 turnovers. Jeremy Lin had 20 points off the bench for Atlanta, which had 24 turnovers. HAWKS: First-round Trae Young pick Trae Young scored 11 points, making 2 of 3 from distance. He had five assists and two turnovers, finishing the preseason with 5 assists and 11 turnovers. UP NEXT: Atlanta (2-3) plays at New York on Wednesday. ... Miami (3-3) plays at Orlando on Wednesday. Gary Harris scored 18 points and Jamal Murray added 17 as Denver won at Chicago. Nikola Jokic backed up the two second-year players with 15 points, seven rebounds, five assists and two steals. The Bulls closed within 88-87 with 4:09 to play as Jabari Parker, who scored 19 points, scored eight straight. NUGGETS: Juan Hernangomez only had 3 points but it was his trey just before Parker's run that gave the Nuggets a nine-point lead. He also blocked Cristiano Felicio's layup attempt with 2:42 and the lead at two. BULLS: Point guard Kris Dunn had two points, three assists and six turnovers in 22 minutes. Denver scored 20 points off turnovers, 19 in the first half. First-round draft pick Wendell Carter Jr. had 10 points and nine rebounds. UP NEXT: Denver (4-1) plays at the Los Angeles Clippers on Wednesday. ... Chicago (2-3) plays at Philadelphia on Thursday. 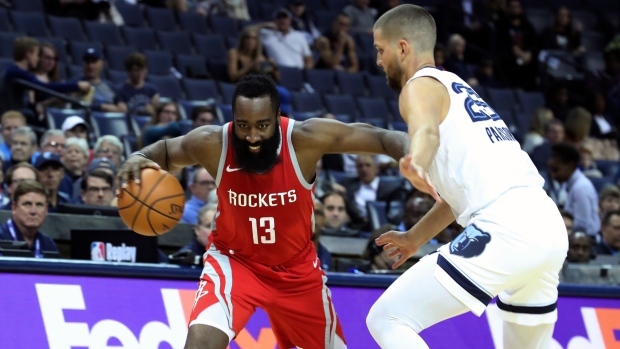 James Harden scored 23 points and Chris Paul and Clint Capela had double-doubles as Houston cruised at Memphis. Paul had 14 points and 11 assists and Capela 12 points with13 rebounds. Seven players scored in double figures for Houston, which made 20 of 47 3-pointers. First-round draft pick Jaren Jackson Jr. led the Rockets with 18 points in 21 minutes. ROCKETS: Carmello Anthony was 3 for 10 in 26 minutes as a reserve. He had 10 points, making 3 of 6 from long range, and averaged 13 points on four games. GRIZZLIES: Second-round pick Jevon Carter was scoreless in three minutes. Giannis Antetokounmpo 32 points on 13-of-17 shooting, 12 rebounds and 10 assists as Milwaukee rolled at home. He had 14 points in the first quarter as the Bucks took a 43-27 lead and 28 at at the half when it was 84-53. Taj Gibson had 21 points for the Timberwolves. TIMBERWOLVES: In addition to missing Butler, Andrew Wiggins did not make the trip for personal reasons. First-round pick Josh Okogie scored 11 points, his high for the preseason. Second-round pick Keita Bates-Diop added eight points. BUCKS: Went 25 of 38 from 3-point range with Khris Middleton, who had 22 points, going 5 of 8. First-round pick Donte DiVincenzo had five points, giving him 31 in four preseason games. UP NEXT: Minnesota (1-4) plays at San Antonio on Wednesday. ... Milwaukee (3-1) plays at Charlotte on Wednesday. C.J. McCollum scored 21 points, Zach Collins had a double-double and Portland held off the Kings after Frank Mason III missed a runner as time ran out. Collins, a first-round pick last year, had 15 points and 10 rebounds. Reserves Meyers Leonard had 17 points and Nik Stauskas 15. All five starters scored in double figures for Sacramento with Buddy Hield and Yogi Ferrell scoring 19 apiece and second overall pick Marvin Bagley III adding 15. KINGS: Although it was a loss, it was a pretty good bounce back after a 132-93 loss at Utah on Thursday. ... Bagley averaged 14.2 points an 7.8 rebounds in five preseason games. TRAIL BLAZERS: Damian Lillard went 2 for 10 from the field and scored seven points. ... First-round pick Anfernee Simons, expected to play in the D League, missed his only shot in five minutes of play but he had 26 points in the four previous games. UP NEXT: Sacramento (2-4) hosts Utah on Wednesday night. ... Portland (3-2) hosts the Lakers on Thursday. Rookie Sviatoslav Mykhailiuk scored 22 points, Kyle Kuzma added 19 and the Lakers beat the Warriors for the second time in three nights. Klay Thompson scored 21 points in the first half for the Warriors. Stephen Curry added 16 points. The duo combined for seven 3-pointers. LAKERS: Rajon Rondo and LeBron James sat out. ... Mykhailiuk was 8 of 18 from the field and fellow rookie Johnathan Williams had 14 points and 12 rebounds. WARRIORS: Every fan attending the game at the SAP Center in San Jose received a Kevin Durant San Jose Sharks-themed bobblehead. But he did not play. ... Curry scored all of his points in the first quarter when the Warriors built a 38-29 lead. Thompson had 14 in the second quarter when the lead reached 65-54 at halftime. Both sat out the second half. UP NEXT: Los Angeles Lakers (3-3) play at Portland on Thursday. Golden State (1-4) hosts Oklahoma City on Tuesday.